If March was supposed to herald at least the beginning of the anticipated yearly rebound, April put that idea to rest. In terms of retail sales, one of the most important and largest segments of “demand”, April’s figures were mostly the worst of the recovery and some of the worst in the entire series – “beating” out February in every category. 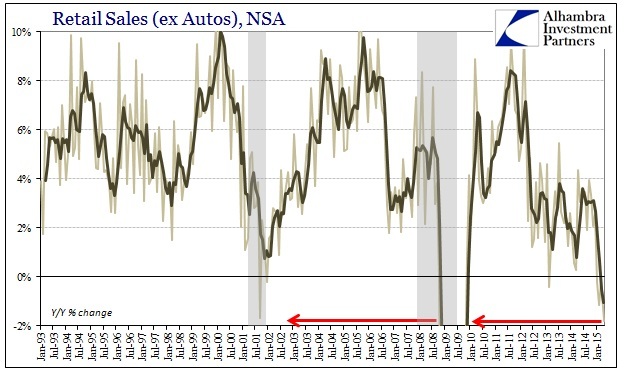 Even including autos, total retail sales gained just 0.72% in April more than suggesting there really is a major economic problem brewing. 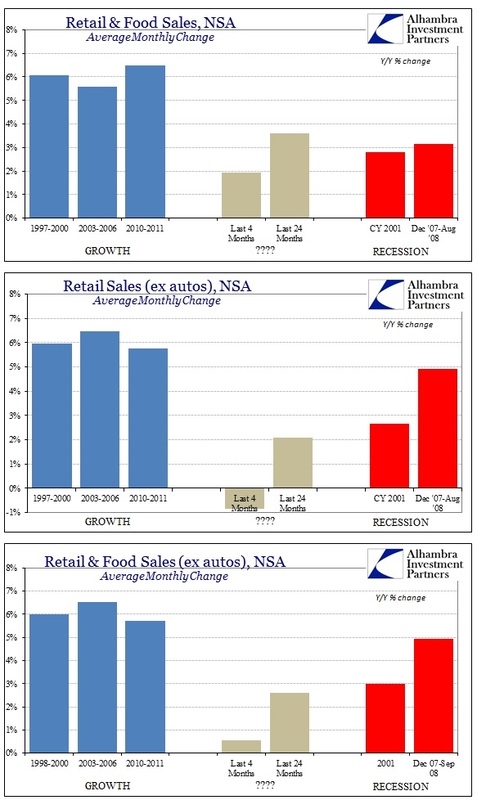 Among the other segments, the figures are getting truly dire (all numbers are year-over-year not-adjusted): retail & food sales ex autos -0.35%; retail trade incl. autos –0.26%; just retail ex food ex autos -1.80%; general merchandise stores -1.52%. While these numbers are severe on their own, this is a contractionary environment that now stretches at least four months and in some cases five. Recessions are not spontaneous events but rather the accumulation of negative pressures and results. 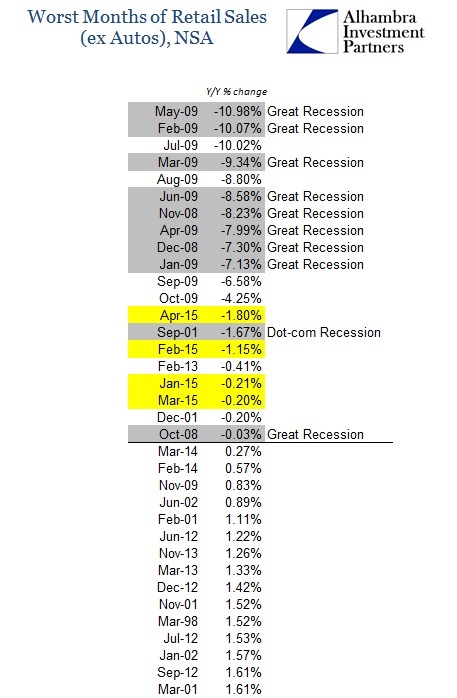 There can be no doubt that consumers in the US right at this moment are acting out of recessionary impulses. 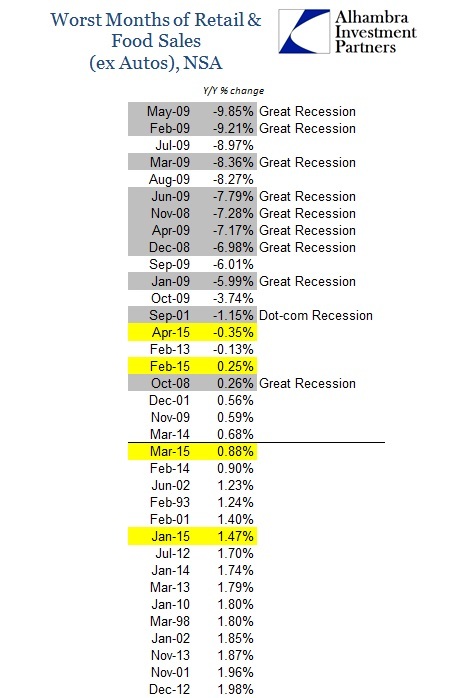 The negative Y/Y changes, which are actually quite rare, place April 2015 among the very worst economic months of the entire series dating back to 1992. In addition to registering these atrocious results, the trajectory continues on in the “wrong” direction. In other words, not only is the US economy accumulating contraction the outlook isn’t indicative of that changing anytime soon. Households are pulling back, staying back and doing so rather quickly. We have pushed way past last year’s “aberration” in the polar vortices and way past even the immediate aftermath of the 2012 slowdown (which hit in the also-snowy winter of 2013). You can make the argument that the full US economy is not in recession but it is now exceedingly difficult to sustain any position that doesn’t put the consumer already there. With capital goods spending equally unstable and sinking, as well as the “dollar” yet having companies cut back in all major costs, it is very troubling that these highly negative estimates have occurred without the much larger and heavier recessionary forces that are still likely as downstream events; those would include the as-yet oil sector retrenchment. 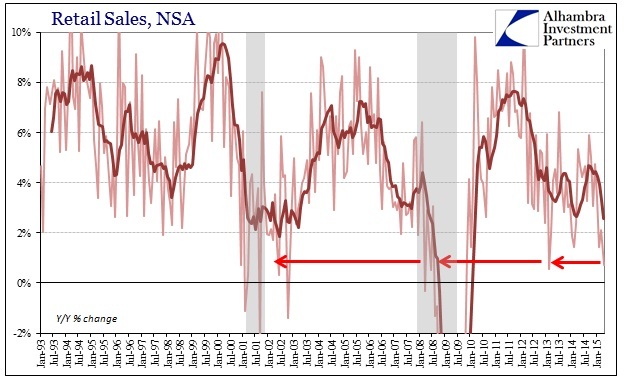 Furthermore, there is still the massive inventory overhang that has been accumulated in the last year or so likely upon the word of economists that what has already occurred was impossible. That places even further emphasis on the downsides still coming up as that inventory will slow the entire supply chain liquidations first. 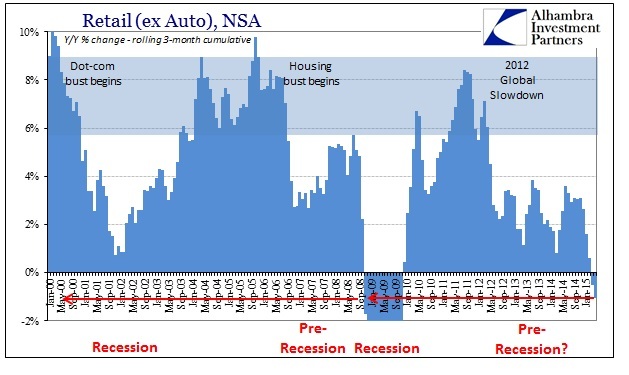 In other words, if this is a consumer recession taking shape then the full economy is just now seeing the leading edge with the worst, potentially, yet to come. The world that Janet Yellen was talking about late last year is completely gone and there isn’t much left of even hope to salvage it; though I suspect they will keep trying to the last inappropriate data point.